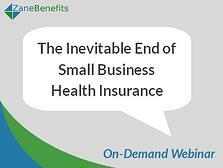 Free Webinar on the Changing Small Business Health Insurance Market is Now Available On-Demand! This week, Zane Benefits discussed "The Inevitable End of Small Business Health Insurance" via webcast. The feedback has been outstanding, so we've made a recording available to everyone. During the webinar, Zane Benefits President Rick Lindquist discusses how the small business health insurance market is undergoing a dramatic transformation, and why it's estimated that 60% of small businesses will eliminate employer-sponsored health insurance in favor of individual health insurance and Defined Contribution by 2017. Health insurance professionals, CPAs, and employers should watch this 35-minute webinar for a data-based discussion on the history and future of small business health insurance.